Hazardous chemical storage guidelines are meant to bring safety to the workplace. When it comes to storing hazardous chemicals, there are several things to consider. First, what hazardous chemicals do you plan to store? Each substance acts differently according to its environment, so has different storage requirements. Among the risks involved with hazardous chemical storage are fire, explosions, blasts, and chemical reactivity, which could lead to any of the other hazards. Proper storage of your hazardous chemicals takes into account each of these hazards, and takes measures to prevent them from occurring. If you’re working in a place that regularly stores hazardous chemicals, make sure you understand safety procedures so you can take part in preventing dangerous chemical reactions. Knowing hazardous chemical storage guidelines can enable you to protect yourself and others within your workplace from potentially lethal incidents. It is important to understand the risks involved with hazardous chemical storage so you can take steps to mitigate, and even prevent them. Certain hazardous chemicals pose a fire risk. They are flammable or combustible, capable of igniting at a certain temperature. Once these chemicals catch fire, they pose even more of a risk because of dangerous fumes, or reactions with other chemicals. Some chemicals are not flammable, but might be oxidizing agents or even explosive materials. Oxidizers promote or initiate combustion of other chemicals, so it is important to keep them segregated from flammable materials. Explosive materials pose life-threatening dangers if exposed to flame, especially if stored in bulk amounts. Your hazardous chemical storage should take into account the hazards of each chemical, so you can store them properly. If your chemicals are a health hazard, it is important to be prepared in the event of a dangerous leak or spill. Containment sumps can prevent hazardous chemicals from escaping your storage area, keeping it out of groundwater and away from personnel. If your chemicals produce toxic or corrosive fumes, equipping your hazardous chemical storage building with mechanical ventilation can control fumes and fume production, keeping the air fresh for your personnel to breathe. 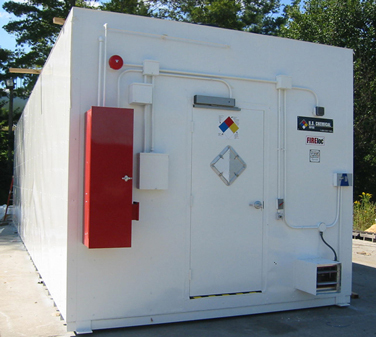 For your hazardous chemical storage, we have hazmat storage buildings to suit your every need. Your hazmat storage building should serve to protect your personnel by segregating incompatible chemicals, preventing chemical reactions, fires, and explosions, and maintaining your chemical storage environment. Our hazmat storage buildings are designed according to your storage requirements in order to mitigate chemical storage hazards. We offer accessories so you can fully customize your building and help you prepare for incidents such as leaks, spills, and chemical fires. When it comes to hazardous chemical storage, our hazmat storage buildings are built specifically for compliance, safety, and efficiency, granting you peace of mind and protecting your reputation with a name you can trust.